A Movie Review by Dan Stumpf: JUDAS KISS (1999). Will Carney didn’t set out to get a reputation as a gunman, but that’s the way things have worked out. He drifts through the Southwest, looking for a place where he won’t have to use his gun. He’s in Tombstone at the time of the famous shootout at the O.K. Corral, but although he knows most of the participants (he sits in on a poker game in the Oriental Saloon where Doc Holliday regularly plays), he manages to avoid getting involved in that violent confrontation. However, when he kills an hombre who’s trying to attack a young woman, he winds up with the dead man’s powerful family after him and decides it’s time to move on. Unfortunately, he rides north to a settlement where an old acquaintance is trying to take over and wants Carney to throw in with him. Complicating things, an Apache medicine man has convinced a number of warriors to leave the reservation with him and set off on a series of bloody raids. And then Betsy Gaye, the girl Carney rescued back in Tombstone, shows up, and so does the brutal patriarch of the family that wants him dead . . .
That’s the setup of THE GUNSHARP, a Gold Medal paperback original novel from 1967 by William R. Cox, a prolific contributor to the Western and detective pulps who went on to a long, successful career as a paperbacker, most notably by taking over the Buchanan series under the house-name Jonas Ward after series creator William Ard died and there were a couple of fill-in novels by Robert Silverberg (finishing a manuscript Ard started) and Brian Garfield. 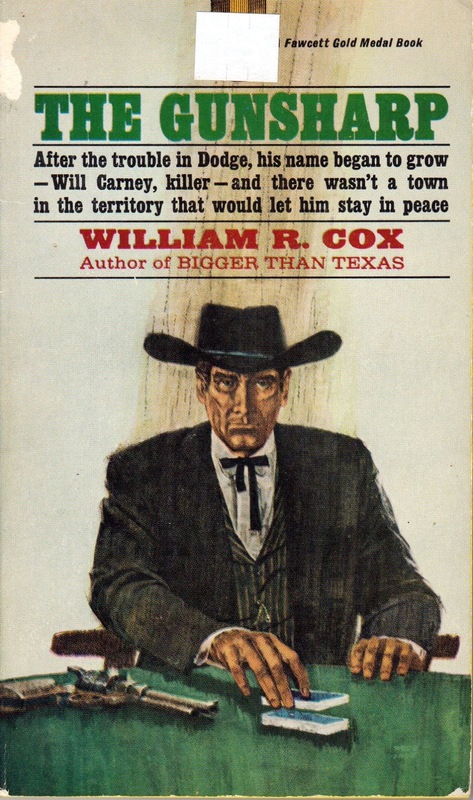 Cox wound up writing more Buchanan novels than anybody else, and he had a series of his own about a sheriff named Cemetery Jones. He also wrote a Gold Medal Western entitled BIGGER THAN TEXAS in 1963, which holds a special place in my heart because it was the first adult paperback I ever bought, plucking it off the spinner rack in a drugstore in Goldsmith, Texas, while we were there visiting relatives. I have a replacement copy of that one and plan to reread it one of these days. But back to THE GUNSHARP . . . There’s a nice hardboiled tone to this one that becomes almost noirish as it seems that Carney has a new problem everywhere he turns. Cox also does a good job with the Arizona landscape, and a long scene in which Carney and Betsy are pursued by the Apaches through a nighttime thunderstorm and flash flood is excellent. The supporting cast, including a married couple with problems of their own who run a hotel and café, is interesting. My only real complaint is that a little too much of the action takes place off-screen, so we get people talking about what happened instead of seeing it for ourselves. But there’s not enough of that to slow down the book too much, so for the most part things roll along quite nicely. Cox was never in the top rank of either Western or mystery writers as far as I’m concerned, but he was always a solid second tier author, dependably entertaining. THE GUNSHARP is worth reading if you come across a copy like I did. Mine came from Recycled Books in Denton, like last week’s Forgotten Book, and is in excellent shape except for that blasted sticker the store stuck on it and a little damage to the spine, both of which you can see in the scan. His Gold Medal paperback "Make my Coffin Strong" has to be one of the best titled books they published. A book that I have but never read. In 1961 Cox published a biography of the Western gunslinger LUKE SHORT AND HIS ERA. I've heard an unsubstantiated rumor that this one was ghosted by Robert Silverberg. Do you know anything about this, James? Awful cover, but you can usually get a sticker off with lighter fluid. Soak the sticker with it and carefully lift it off with a single-edged razor blade. Clean up and glue residue with more lighter fluid and a rag. About this author you must try "Comanche Moon", his best western novel that, in the author's words, was suggested to him by his friend Bob Chenault, who came with the title and an idea about a bounty hunter who sold Indian scalps to the Mexican government. From that grew a screen treatment in which Pierce, the scalp hunter, become the central figure. Other folk took form, and the entire Comanche nation on their annual Moon Raid become involved, and the story gained proportion and then from the screen treatment came the novel. Truly a must for the aficionados of western novels. Thanks for the recommendation. I'll definitely look for it.